Doha, Qatar: Aug 30 , 2010: As the State of Qatar moves closer to realizing the Vision of His Highness the Emir, Sheikh Hamad Bin Khalifa Al-Thani, for Qatar to reach a liquefied natural gas production capacity of 77 million tonnes per annum, by far the largest LNG capacity in the world, His Excellency Deputy Premier and Minister of Energy & Industry and Chairman of Qatar Petroleum, Abdullah Bin Hamad Al-Attiyah, has announced the formation of a multi-company, multi- discipline 77Mta Task Force charged with marking the achievement of this historic milestone. In addition to His Excellency’s formation of the 77Mta Task Force, His Excellency appointed Abdulaziz Al Malki, Director, Office of Deputy Premier, as Chair of the 77 Higher Committee to oversee the plans. The 77 Higher Committee has representation from the Qatar Petroleum (QP) Group of Companies, namely Qatargas, RasGas and Ras Laffan Industrial City (RLIC) led by QP. It will be the first time this dynamic group of companies and disciplines will have come together to present such a significant achievement for the State of Qatar. Work is already underway to ensure that every aspect and milestone, from the conception of His Highness’ vision to the present day, is captured in a unique and inspiring way. Close communication and collaboration has begun with other interested stakeholders, including the offices of the Emiri Diwan and company shareholder representatives, ensuring this significant milestone is captured in a way that has never been seen before. The central event of the 77 Mta of LNG will take the form of a celebration showing all aspects of the projects, the people and infrastructure which have made this achievement possible. It is anticipated that the 77Mta event will be held on Monday 13 Dec 2010 at Ras Laffan to be shared with a global audience along with the world’s media. At the national level, Qatar is committed to achieving the goals of the Qatari National Vision 2030. This Vision identifies the key economic outcomes resulting from the responsible exploration of the nation’s oil and gas resources. The 77Mta LNG achievement has certainly been instrumental in forging the Qatari skyline, the infrastructure, Qatar’s global positioning and providing lasting foundations for the education and the health of the nation as well as addressing issues of environmental well-being. The 77Mta celebration will, in addition, recognize the need to establish a balance between reserves and production. Today, as His Excellency Al-Attiyah announces the formation of the 77 Task Force, the first step in the journey of 77Mta has been taken. Over the next 103 days the community in Qatar and exporting markets will be encouraged to engage, acknowledge and play their part in celebrating the nation’s LNG achievements. Qatargas pioneered the liquefied natural gas (LNG) industry in Qatar. Today, the company is realizing its vision to deliver LNG to customers around the globe from our world-class facilities in Qatar. Qatargas was established in 1984 and since that time the Company has progressively established itself as a leading player in the LNG industry. The company was originally formed to operate three LNG trains with a design capacity of two million tonnes per annum (mtpa) each. The shareholders in this venture (referred to as Qatargas 1) are Qatar Petroleum, ExxonMobil, Total, Mitsui and Marubeni. After a successful debottlenecking project completed in 2005, the total production capacity of Qatargas 1 increased to nearly ten mtpa of LNG. Qatargas 1 exports LNG to customers in Japan and Spain under long and mid-term contracts. Currently the Company is undergoing a period of rapid expansion, which when completed in 2010 will see us exporting 42 mtpa to markets in Europe, Asia and North America. In 2009, the Company successfully started production from two new 7.8 mtpa mega trains - Train 4 and Train 5. These are the largest LNG trains to ever be built and togerther comprise Qatargas 2. Qatargas 3 (Train 6) and Qatargas 4 (Train 7) will increase the total number of LNG trains to seven from the existing five. Qatargas 1 consists of three onshore LNG trains with a total combined capacity of 10 million tonnes per annum (mtpa). 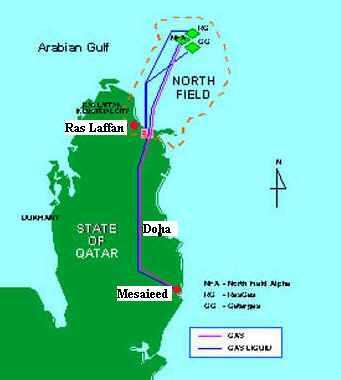 The Qatargas offshore production, separation and treatment facilities on the North Field are located about 80 kilometers North-East of Qatar’s mainland. 22 production wells have been drilled and completed to supply 1,600 million standard cubic feet (45 million cubic meters) of raw natural gas per day from the field’s reservoir, underneath the seabed. The processed gas is transferred to shore with the associated condensate via a single 32-inch sub-sea pipeline, where it becomes the feedstock for the onshore LNG plant. The formation of the operating company has several benefits. In addition to efficiently providing services to an increasing number of trains and shareholders, the operating company structure allows the Qatargas projects to achieve maximum synergies. The role of the operating company is that of a service provider with no equity interest. With its current operations, Qatargas has delivered well over 1700 cargoes as of end 2009. Qatargas is recognized worldwide as a secure and reliable supplier of LNG. RasGas acts as the operating company for and on behalf of the Project Owners noted below. Its personnel manage and supervise the design, construction and operation of various facilities under the terms of a ‘Services Agreement for Operation and Maintenance’ signed in 2002. The company employs more than 1,400 staff, working on a variety of projects. In 2003, RasGas was designated to manage and supervise the design, construction and operation of a helium facility on behalf of Ras Laffan, Ras Laffan (II) and Qatargas. The Central Helium Recovery unit (HeRu) project at Ras Laffan extracts helium from RasGas (Ras Laffan and Ras Laffan (II)) and Qatargas (QG 1) LNG trains, and puts Qatar on the map as the provider of 10 per cent of the world’s helium. RasGas has also signed a technical services agreement to manage and supervise activities related to Qatargas (II)’s drilling programme in addition to its own drilling programmes. Ras Laffan was established in 1993 to produce LNG and related products from its two trains: Trains 1 and 2. The two plants have a combined capacity of 6.6 million tonnes of LNG per annum (Mta) as well as about 45,000 barrels per day (bpd) of condensate. Ras Laffan’s key customer is Korea Gas Corporation (KOGAS). Established in 2001 to produce LNG and related products, Ras Laffan (II) owns Trains 3, 4 and 5. Each of these trains has the capacity to produce 4.7 Mta of LNG and about 28,000 bpd of associated condensate. Ras Laffan (II)’s key customers are Petronet LNG of India, Edison Gas of Italy, Distrigas of Belgium and Endesa of Spain. Ras Laffan (3) was formed in 2005 to produce LNG and related products, Ras Laffan (3) owns Trains 6 and 7, which are currently being constructed. Trains 6 and 7 will each have capacity to produce 7.8 Mta of LNG and approximately 50,000 bpd of condensate. Ras Laffan (3)’s customers will include the United States and Asian market.